Of course, his chance meeting with Roberta Duran (Lena Olin) made both possibilities an enticing reason to help the cause. After Bobby and her husband disappear during a military raid, Jack finds himself playing cards with their captors, perhaps even their killers… There is, in this authentically high stakes game, an irony and forboding that give the film a welcome toughness. “These people want to bring down everything you’re here for!” exclaims one of Jack’s new poker-playing acquaintances, speaking aptly of the imminent revolution. A sporty lightweight suit is a must for a slick gambler looking to make his mark in a Havana poker game, and Jack Weil is nattily dressed for just that occasion in this tan gabardine suit, styled and tailored similarly to the turquoise suit worn earlier for a night out on the town. While the turquoise suit ensemble consisted of bold, colorful pastels, this outfit makes use of creamy and brown earth tones from head to toe. For being such a legendary gambler, Jack’s “poker face” leaves something to be desired. 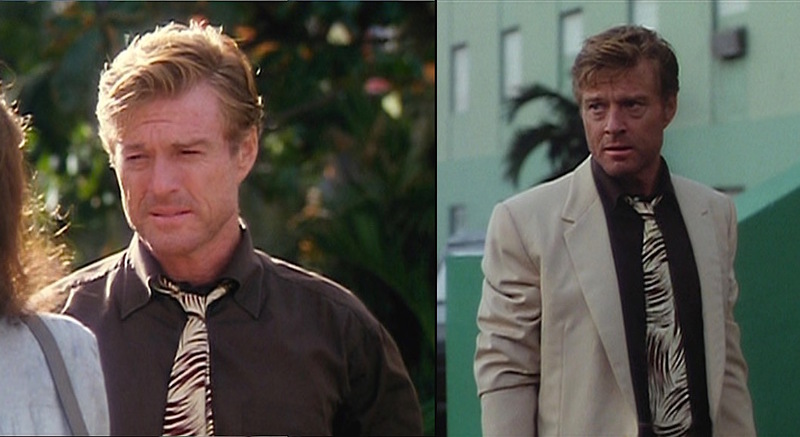 Redford’s tan gabardine suit from the film, here featured with a navy cotton dress shirt worn with a different outfit in an earlier scene. 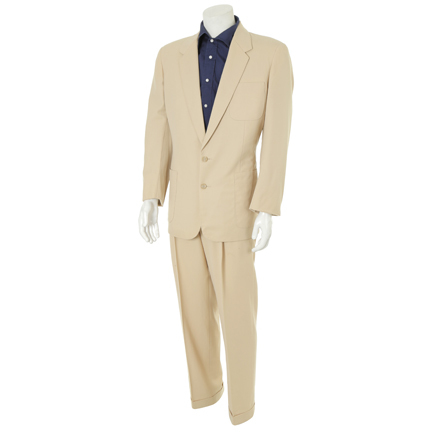 The two piece custom made tan suit has a notch lapel, three patch pockets, two button front closure, and pleated pant with cuff. Internal Western Costume jacket label with ” 2208-1, Robert Redford, Chest 41, Sleeve 17 1/2, 2A, #1″. The sporty patch pockets on the left breast and hips drop the suit’s formality down a level. The back is ventless and there are three buttons at the cuff of each sleeve. The single-breasted jacket’s low two-button stance is appropriate for the film’s 1950s setting and creates a flattering “V” effect that is accentuated by the wide, padded shoulders that appear on most of Redford’s tailored clothing in his movies. The lapels have a narrow semi-notch rather than the traditional equilateral notch. Unshaven and rumpled but still unruffled. Per the era’s fashions, the trousers have double reverse pleats, cuffed bottoms, and a high enough rise to perfectly meet the jacket at the buttoning point on Redford’s natural waist. Straight pockets are cut along each side seam, and the back pockets are jetted (with a button through the back left pocket.) The bottoms are cuffed. The trousers’ slim belt loops are positioned about a half-inch down from the top. Jack wears a 1″-wide dark brown leather belt with a gold rectangular box-out buckle. 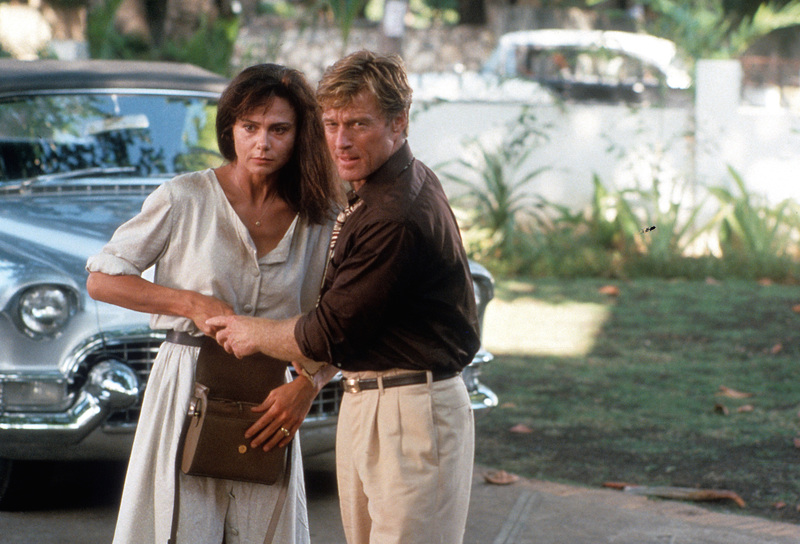 Production photo of Lena Olin and Robert Redford in Havana with Jack’s snazzy silver Caddy convertible behind them. 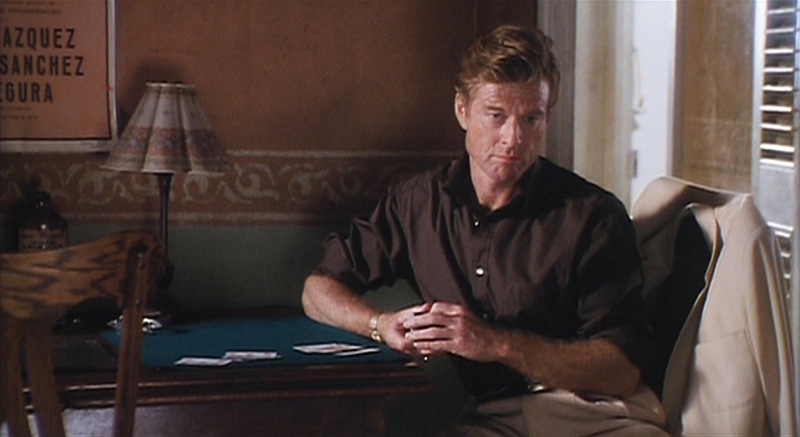 For his hotel suite poker game, Jack sports a dark chocolate brown cotton shirt with the shaped “Mr. B.” spread collar that Anto used on all of his Havana dress shirts. The fitted shirt has no darts or pleats in the back and closes up the front with large white buttons on a placket. The shirt has a single breast pocket and single-button cuffs, although Jack often unfastens them to roll up his sleeves when not wearing his jacket. A poker game may call for a coat and tie, but Jack’s solitaire round has a more liberal dress code. 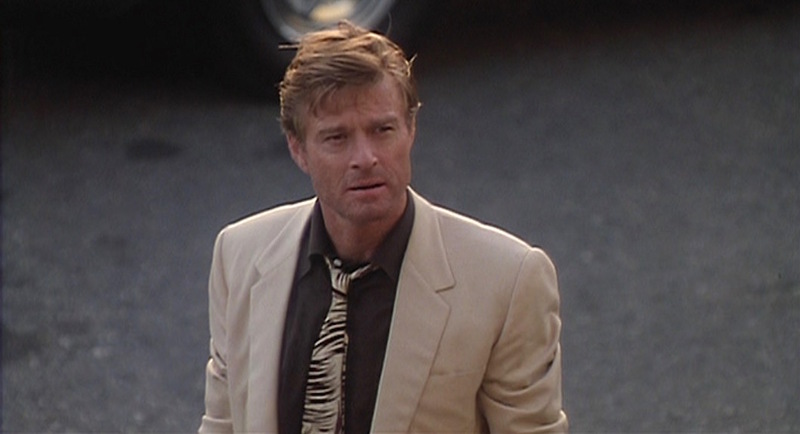 In this sequence, Jack wears a cream printed silk tie covered in abstract brown brush strokes, at times evocative of an animal print or tiger stripe. He wears the tie in a four-in-hand knot, often loosening up when a situation doesn’t call for total formality. 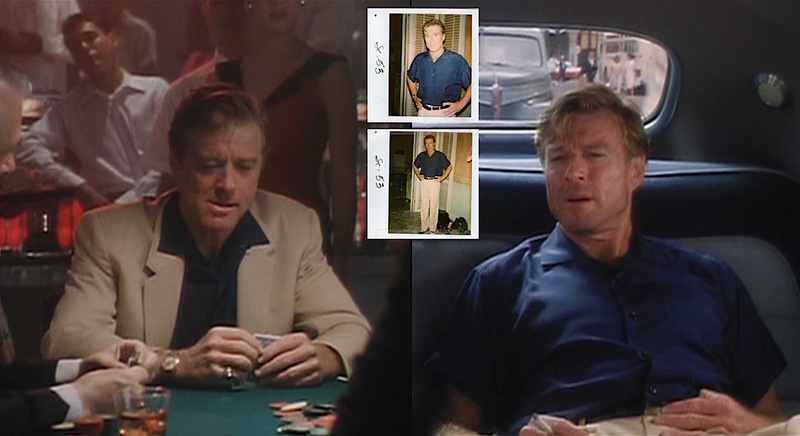 As Redford learned in The Sting, high stakes poker games require a tie… of course, they never say just what that tie should or shouldn’t look like, allowing Jack Weil the freedom to dangle a piece of silk-printed ’50s decadence around his neck. 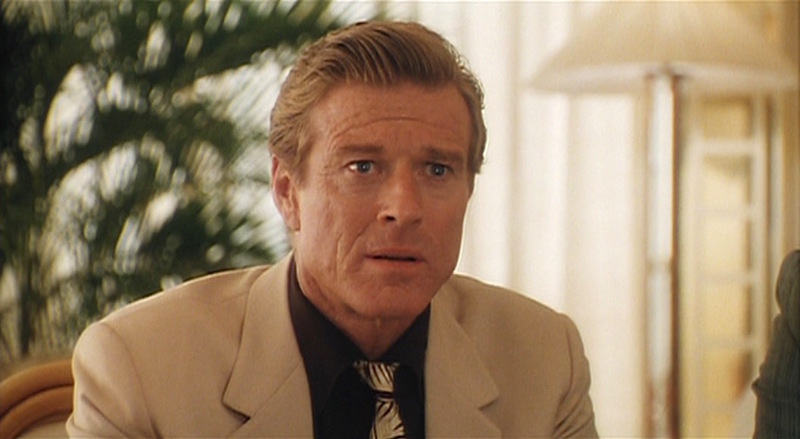 Jack would also wear this suit for a long night of revelry in a Havana casino, dressed down in a navy rayon short-sleeve sport shirt and the same black belt, black socks, and black-and-white spectator shoes from the opening scene. This combination of suit and shirt is currently available at The Golden Closet, where it is currently on sale for $1,950. According to The Golden Closet, the shirt is tagged internally with “Venice Custom Shirts” and dated for November 1989. It has a flat camp collar, large breast pocket, and plain front with seven large blue plastic buttons. The fit is comfortably large with the short sleeves ending half-heartedly cuffed at his elbows. This suit’s first appearance is technically during Jack’s burlesque night out before the big game. The two inset Polaroid photos, ostensibly taken by the film’s costumer, are sourced from The Golden Closet. NB: The other navy shirt featured with this suit on The Golden Closet is a long-sleeve cotton dress shirt made by Anto in the same style as the brown shirt. 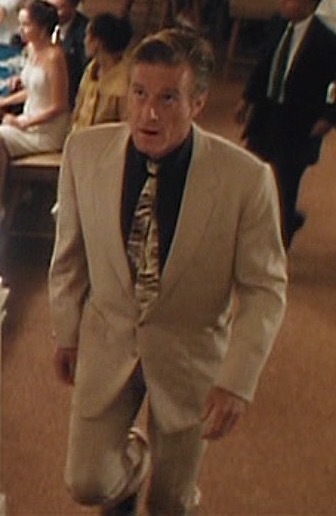 It was never worn with this suit on screen; instead, it was featured with a blue dupioni silk jacket and deco-printed tie during the opening scenes. Jack Weil is the sort of guy who would have two-tone shoes for every occasion. 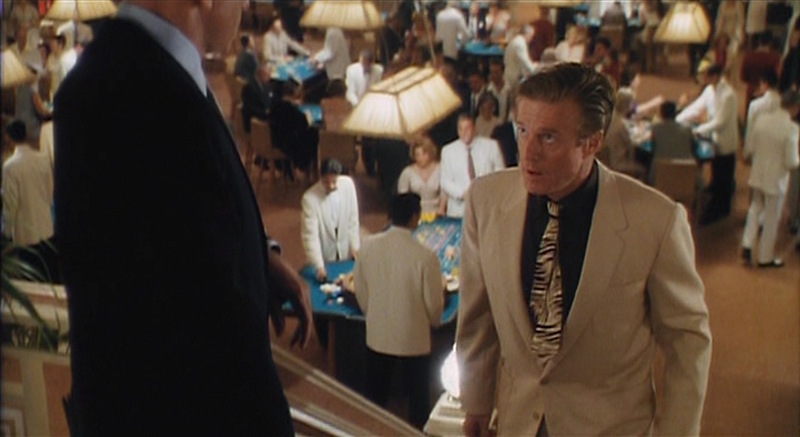 In fact, it is a shot of his black and white spectator shoes that introduce us to the character during a shipboard poker game at the outset of the film. The hotel suite poker game marks the first appearance of his brown duotone spectator shoes from Bragano, a pair of oxford brogues in walnut brown leather and light brown nubuck with medallion punched wingtips and dark brown laces through five eyelets. His socks are obviously dark, but the costumer tag available at The Golden Closet confirms that they too are brown, the next-best option if he wasn’t going to wear tan socks that would continue the trouser leg line. 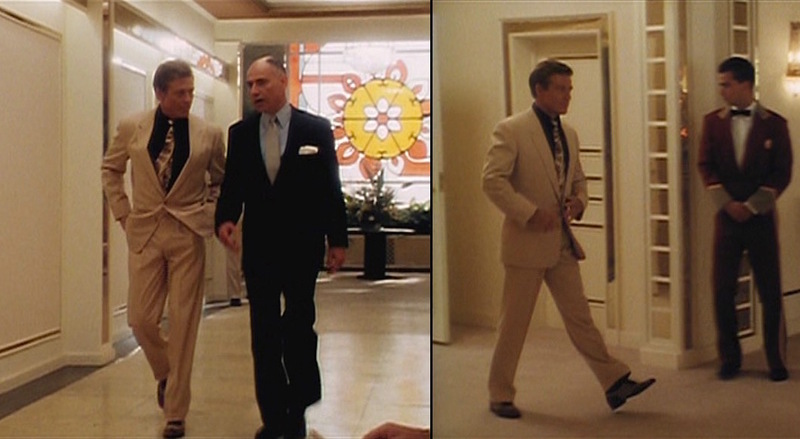 Big shot that he is, Jack Weil exudes confidence as he struts into Joe Volpi’s private poker game, accompanied by Joe (Alan Arkin) himself. He would later wear the same shoes with his cream linen jacket, light blue shirt, and brown trousers. 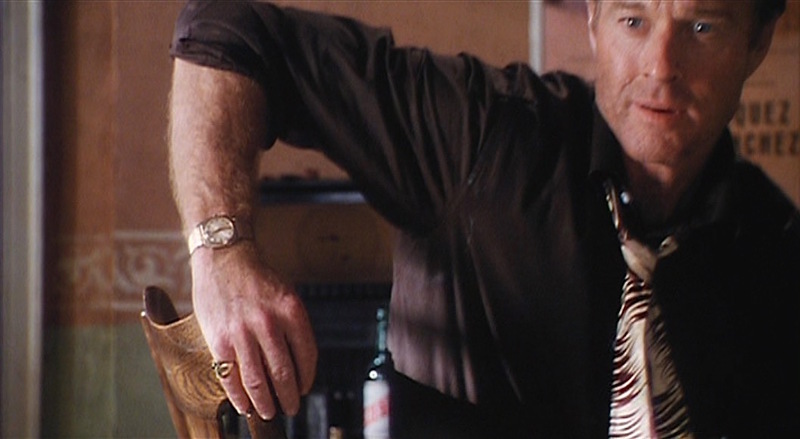 Jack’s jewelry is all gold, reflective of his gambler image and – in this case – well-coordinated with his earth toned outfit. He wears a gold signet ring on his right pinky and, also on his right wrist, he wears a yellow gold wristwatch with a round gold dial and flat gold bracelet. Hosting a poker night soon? Class it up with a playlist reminiscent of Jack Weil’s Havana. 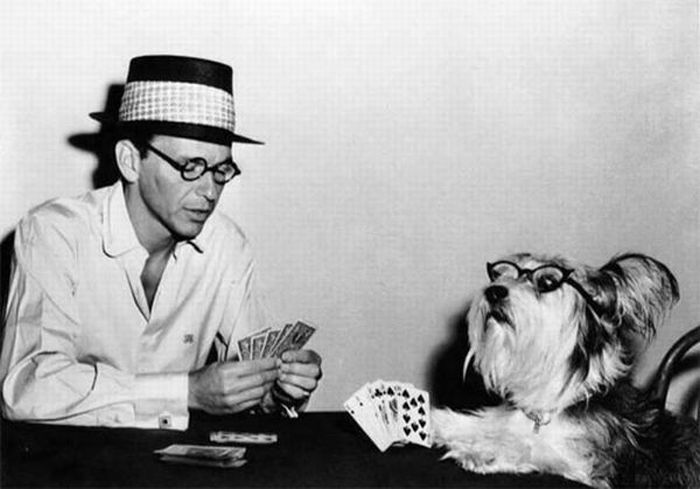 Because when you think poker, you think Sinatra, right? Frank Sinatra is Jack’s background music of choice for lonely nights in, first seen listening to “Let’s Get Away From It All”. Sinatra originally recorded this tune when with Tommy Dorsey and his Orchestra but re-recorded the 1957 version heard in the film for Sinatra’s concept album Come Fly With Me!, the same album that yielded “London By Night,” which he listens to during a round of solitaire at the Duran residence. The high stakes poker game in Joe Volpi’s hotel is scored by Dean Martin’s playful 1955 hit “Memories are Made of This”. Interestingly, the song was adapted into the “Honvágy-dal” (“The Song of Homesickness”) after the 1956 Hungarian Revolution, and Ida Boros’ recording became an unofficial anthem for refugees and protesters around the world, an interesting parallel to the political situation in Havana. For a more boisterous late-night poker game in a burlesque bar, Jack is serenaded by the appropriately titled “One Night (of Sin)” by Fats Domino. Though “One Night” had found commercial success in the late ’50s, first by Smiley Lewis then by Elvis Presley, Fats’ version wasn’t recorded until 1961, making it a slight anachronism for this scene set in 1958. Jack Weil looks cool and ready in his tan gabardine suit as he joins his high stakes pals for the big game that drew him to Cuba in the first place. One of my favourite of Redford’s films. He looked great at 53. His costumes were amazing and perfect for the 1958 setting. Redford had a 41 inch chest and 32 inch waist, not many star of his era was ever as trim at 53. A head of his time. Sweet. I’ve been waiting for this post for a couple of years. THANK YOU. Great post. 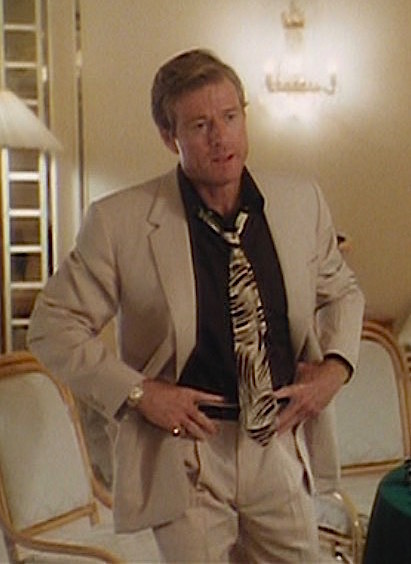 Redford wears his clothes with great flair in this film. Any thought about we here to find a chocolate brown shirt with white buttons? ( I think he wears a similar shirt in navy blue later in the film..). Thanks for this excellent blog.